Double row of 13 internees; five are seated in the front row. Man standing at far left holding a clarinet (identified as Giuseppe Frascadore) is wearing shorts suggesting a summer timeframe. Most of the members of the band/orchestra are holding instruments including: trumpets, french horns, tuba, saxophone, clarinet, and mandolin. The group is positioned in front of a building whose facing seems to be comprised of studded wood planks, with two visible framed windows. Internee Osvaldo Giacomelli, holding a french horn, is the third man standing from the left. Also identifiable is Antonio Di Pietro, seated second from the left. Photograph is dated in black ink to "1943". As a result, this picture would have been taken in Fredericton Internment Camp, where the remaining Italian Canadian internees were transferred in July 1942. An identification card reading "A11" is positioned on the ground beside the internee seated at the far right. The identification card used suggests it was a formal picture taken by a government official. 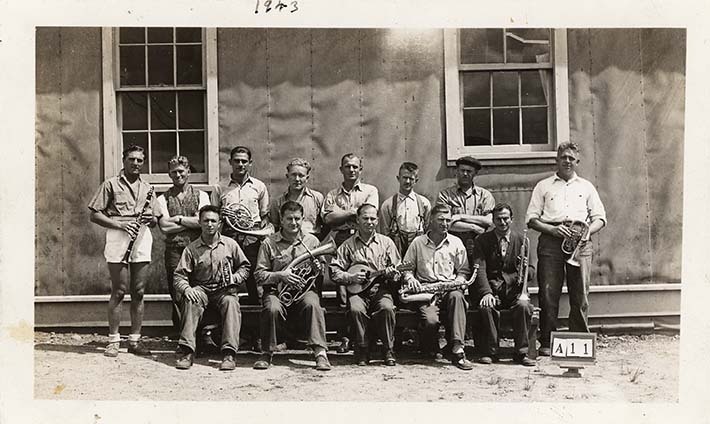 Several of the Italian Canadian internees were skilled musicians. At camp, they formed a band which entertained others by performing recitals. We also know that lyrics were composed by a few of the internees which specifically spoke about or referenced the internment experience. Instruments were provided by family members and by charitable organizations. Possibily Internment Operations also secured instruments for internees. This photograph belongs to a collection compiled by Italian Canadian internee Osvaldo Giacomelli. Previous to his death, he had spoken on the record about his internment to journalists and academics. Some suggestion has been made that Giacomelli was a fascist supporter and Mussolini-adherent. He was one of the longest-serving of the Italian Canadian internees, released on May 29, 1945. Giacomelli himself felt that he was wrongfully interned, and sued the Government of Canada in 2005. When Giacomelli died in March of 2006, his case was still unresolved.